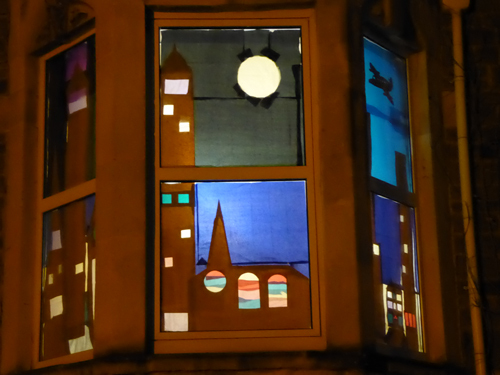 Window Wanderland, the ever popular winter spectacle, lit up the streets around Chandos Road in Redland at the end of February. Shop windows and houses were decorated in all manner of beautiful and quirky images. People came out to view the window scenes but the strong wind and rain had an impact on the weekend’s celebrations. Organiser Fiona McVey said: “Despite Hurricane Ewen, we were delighted to see so many braving the elements to admire the creative and inventive displays in windows & gardens around our streets. Displays included a homage to ‘Hitch Hikers guide’, beautiful ‘stained glass’ scenes, cuddly toys, an owl & pussycat, vegetable portraits and some impressive IT. Enthusiastic feedback at our recent neighbourhood association meeting means we’ll definitely be out decorating our streets again next year." Window Wanderland began as a community project in Bishopston and has been so successful that it has been taken up by many other areas of Bristol. It is a great way to bring the local community together and to light up the dark nights at the end of winter.